The Kindle Paperwhite is the latest version of the e-reader, and it replaces the previous generation Kindle Touch. It’s still a 6inch multi-touch display, But with a built in light, and better resolution. The packaging is the same for both devices, And there’s a seal here that says “frustration-free packaging”. Amazon are really promoting this type of minimalist, easy-to-open boxes. There’s very little writing. You get the product name on the side, Nothing on the back of the box about the product. And on the top, there’s just a pull tab to open it. Let’s take a look at the Fire HD first The box is quite easy to open. And there’s the tablet itself, a nice glossy black. The documents are neatly tucked into the lid. There’s a user manual, And a warranty booklet. The tablet feels solid, But a little heavy in the hand. It’s 395g, a bit heavier than the Nexus7 which is 340g. The only other thing in the box is the microUSB charging and sync cable. You can charge the device from a computer using this, but that’ll take a lot of time. You’ll need to buy a separate USB power adapter to charge from a wall socket. This is a UK three-pin one that I already had with me. That’s everything in the box, Let’s go back to the tablet. The display glass doesn’t come right to the edge, The plastic chassis sort of curves up to meet it in the front. There’s also this very thick bezel all around. Because of the way the camera’s positioned, it feels like this tablet is meant to be held landscape. The light sensor is next to the camera. There are two ports at the bottom, The micro-USB charging port, and the micro-HDMI port. You’ll need to buy a separate cable to use with that. On the right hand side, there’s the 3.5mm headphone jack, volume rocker switch, and power button. There aren’t any buttons on the left hand side. On the top, above the camera, there’s a pinhole microphone. The back feels like a rubberized plastic, and there are dual speaker grilles on either side. The Fire HD has Dolby audio, dual driver stereo speakers, So it’ll be interesting to see how it sounds in the full review. I’m going to switch it on for the first time. This is a 720p HD display, with a resolution of 1280×800 pixels. So a noticeable upgrade from the standard Kindle Fire with it’s 1024×600 resolution display. It’s also IPS technology LCD, so viewing angles should be very good, And I’ll be looking at that in the full review. The lock screen is quite simple, just slide to unlock. You’ll need to set a default language. Then it asks you to connect to a wi-fi network. 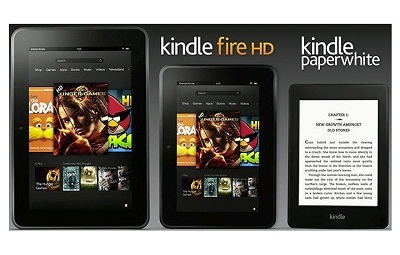 At this stage you’ll be asked to register the Kindle with an Amazon account. If you bought it direct from Amazon, it comes pre-registered to the account you bought it through. Set your timezone. Connect to Twitter or Facebook. This is optional. Next you get several walk-through screens that help you take your first baby-steps into the wonderful world of Kindle Fire. Press ’Next’ or just swipe through them. Finally, press the icon to go to the homescreen. On your homescreen you’ll see your purchased books that are stored on Amazon’s cloud. The apps section shows you the apps you’ve purchased. There are some free ones there to get you started, And you can buy more from the store. It doesn’t look like a huge choice initially, especially compared to the iOS or Android stores, But there are a lot of categories to choose from with more choice inside, like in the Magazines’ category. I want to take a quick look at some other stores. There’s a music store, And this is the newsstand. The notification bar’s at the top, And there are toggles there for volume, brightness, wi-fi, and so on. I’ll leave that to one side for now, And we’ll take a look at the Kindle Paperwhite. It’s in the same type of box with the pull tab, And when you open it you see the Paperwhite first. The same documents are in the lid. There’s a user manual and a warranty card. This is really light compared to tablets like the Fire HD. Underneath it there’s just the microUSB charging cable. Again, you’ll need to purchase a separate USB power adapter to charge it from the mains. The deep black of the paperwhite makes it look similar to the Fire HD, Just smaller, and much lighter. This is a 6 inch display, just like all the previous generation Kindle e-readers. It also has the thick physical bezel going all around, And the plastic has a soft comfortable feel in the hand, Much more comfortable than the glass bezels on tablets. When you see it next to the Kindle Keyboard, There’s not an immediate difference with the screen turned off. The power button is down at the bottom along with the microUSB port. There’s nothing else on the sides or back. There’s no speaker grille. I’ll power it on. The display isn’t actually backlit like you see in LCD tablets, It’s front-lit. There’s three layers to the display, The e-ink layer at the bottom, The touch screen above it, And above that comes a fibre-optic light sheet that guides the light down towards the e-ink layer. It gives you light without the eye-strain that lit screens can typically cause. The other change is in the display resolution, 212ppi compared to the 167ppi of previous Kindles. So it should be much sharper visually, and I’ll show a comparison in the full review. The first screen you see tells you a bit more about the paperwhite display, High contrast, resolution, built-in-light, and of course the 8 weeks of battery life. Next, you’ll need to connect to a wifi network. Again, you’ll need to register your Kindle, or it’ll come pre-registered. Then you have the getting started tips screen. You can’t just read through these, you’ll have to tap along. It’s quite useful actually, Since it shows you how to navigate while using the device. You get a choice of six fonts here, line spacing, margins, different sizes. X-ray lets you look deeper at the elements of the book, like the characters. This shows you how to bring up the dictionary. Next, you can create highlights by dragging over a selection. And thats it, you can go to the homescreen. I’m just going to take a look inside a book. The display looks good. There’s not a huge difference when you compare it to the Kindle keyboard’s display in daylight. I’ll do a full comparison under different light settings in the upcoming review. Looking at the paperwhite along with the Fire HD, The real difference is in functionality, since the Fire HD is a full tablet. But the immediate difference is in the weight, With the paperwhite feeling lighter and more comfortable in the hand. I’ll be posting the full reviews for both these devices soon.